Jason, fantastic work, thanks for sharing! The werewolf painting almost looks like a woodcut and the Christopher Lee Dracula is perfect! Thanks, Joe! Well, the Werewolf artwork was actually based off of two woodcuts so there you go, haha. I wanted to bring the woodcuts to life with a little realism. My 50th Anniversary cards have been approved so I wanted to post a teaser of pack pulls. I'll post my returns as the release date gets closer. Jason, Fan-freakin-tastic! Just too incredible that you painted them up. Really stunning work! Thanks, Joe, I appreciate it as always! Anyone in the Westchester/NYC area in NY? Come see me at the Popcon in Nyack on April 1st. I'll have all kinds of sketch cards and assorted artwork. Hope to see you there! Never too early for such an announcement. (Besides, we're only talking eight weeks from now.) Looking forward to meeting you and the other artists listed on the Allentown Show site. 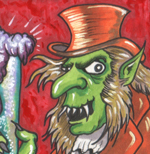 Next weekend, the 21st and 22nd, I'll be a guest artist at the Philly Non-Sports Card Show and I will have tons of sketch cards from many different sets and companies and will also be letting go of a bunch of Wacky APs that I kept over the years. I'll also have a bunch of prints of my horror work from magazines and personal. Last, but not least, I will have blanks available for commission on my new personal stock. If anyone's interested in any kind of sketch card please contact me at jasonbrower1969@yahoo.com. Thanks!